Looking for an ultra-fast, lightweight load for the .357 Magnum, with a penetration profile that other projectiles would be jealous of? This may be the round for you. 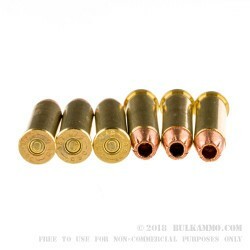 The 95 grain all copper projectile offers high weight retention, substantial penetration and very fast velocity with more than adequate energy delivery and a quality buildout. 1410 feet per second is blazing fast for such a hard hitting round; the copper projectile is capable of delivering 420 ft. lbs. 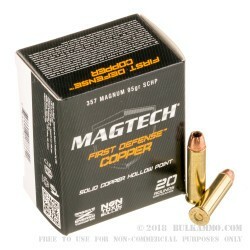 of energy along with this speed; giving performance that is virtually unmatched in the .357 Magnum light load category. As a hunting round this is a dynamic offering, allowing for light weight deer load ballistics, but also offering heavy penetration (more than 18 inches potentially) and a nearly complete weight retention. The quality brass case and the Boxer primer allow for reloading and the powder burns well giving a potent push for the small projectile out of the muzzle. 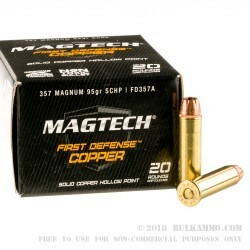 Suitable for use in personal defense situations, especially those where potential hard barriers may exist, though with the harder projectile and the exceptional speed, this bullet may be at risk for overpenetration. 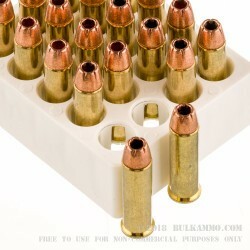 Packaged as a box of 20 and priced at the midrange level for premium loads.